All practices and projects for which cost-share is being sought must meet standards for such projects or practices that have been established by NRCS or some other technically qualified agency or organization approved by the Department. The program provides cost share assistance and other financial incentives for the construction or adoption of projects that conserve soil and protect water quality, that reduce soil erosion and improve water quality, Water Well Decommissioning projects (WDP) to safely decommission inactive water wells and help reduce the potential for groundwater pollution, Nutrient Management Planning (NMP) to encourage farm operators to utilize soil testing to increase efficiency of fertilizer use and reduce nutrient transport to water bodies, and special projects to address unique resource concerns to provide for piloting new practices not on the state-wide docket or target specific practices or initiatives that are local priorities. • Assist landusers with sheet and rill erosion exceeding “T” (tolerable soil loss level), or with ephemeral/gully erosion, in constructing projects, which conserve soil, protect water quality and reduce flooding. • Provide incentives to eligible landusers for the adoption of nutrient management projects that minimize the transport of nutrients to surface water and groundwater. • Provide incentives to owners of abandoned wells to properly decommission and seal the wells so the potential for groundwater pollution is reduced or eliminated. • Address water quality issues related to sediment, nutrients and other non-point source pollutants. Only fields to be planted to corn or sorghum and never before planted no till or strip-till are eligible. Payments are limited to no more than $800 per landowner per year. A landowner is eligible to receive up to 3 payments within a 3 year period on the same acreage, provided the land is in continuous no-till or strip-till and only in the years corn or sorghum are in the rotation. As an example, if a cropping plan calls for a corn, soybean, sorghum rotation; only the years in corn or sorghum (years 1 and 3) would be eligible for a payment. Second and third year payments, if eligible, are contingent upon annual state appropriations. Cost share is eligible only on the portion (acres) of the field exceeding “T”. If other practices are applied with state cost share dollars, and no till or strip-till is necessary to protect the projects for their design life span, the landuser must agree to continue no till or strip-till for the remainder of the design life span with no additional cost share payments for no till or strip-till. If it is deemed necessary due to weed or insect infestations and in the interest of proper agronomic stewardship that these projects must be temporarily discontinued, they must be reimplemented as soon as the reason for their discontinuance has been addressed and maintained for the remainder of the agreement period. Mulch-till is not a cost-share practice but should be reported when required to bring erosion levels to below “T”. Only fields never before planted with a cover crop are eligible. Payments are limited to a maximum of 40 acres for one year per landowner. Cost share is eligible only on the portion (acres) of the field exceeding “T”. If other cost shared projects are applied with cost share dollars and a cover crop or residue management is necessary to protect the conservation projects for their 10-year life span, the landuser must agree to implement this management project for the remainder of the 10-year period with no additional cost share payments. There is no maintenance period for a properly abandoned and sealed well. Once properly completed, the project is considered permanent and there is no maintenance requirement, there is no need to complete a ESC – 1A form for the Well Decommissioning Practice. A limit of twelve wells per district has been set for the FY 09 program year. A landowner who chooses to decommission a well him/herself may include their labor at $15 per hour as part of the project cost as long as the work meets required design and construction guidelines. Irrigation wells being decommissioned are eligible for a higher maximum payment of $750 because of the inherent higher cost to seal this type of well. Pasture and Hayland Planting projects using grasses as the predominant crop will be required to be maintained for a ten (10) year period. Where clover and/or alfalfa are the predominant crop, the landuser must agree to maintain the project for a five (5) year period. The cost-share rate is 60% up to a maximum of $160 cost-share per acre which ever is less. The cost-share rate in TMDL Watersheds is 80% not to exceed $200/acre which ever is less. Example 1: landuser cost of $266.66/ acre x 60% = $160 per acre cost-share. Example 2: landuser cost of $160/acre x 60% = $96 per acre cost-share. Eligibility is limited to plans of 10 acres or more where the next crop planted is corn or sorghum and is scheduled for an application of N, P or K fertilizer. A maximum of 200 acres to any landuser in one year is allowed. A landuser is eligible to receive up to 2 years of payments on plan implementations during the years when corn or sorghum are grown in the crop rotation. The second payment, if eligible, is contingent upon annual state appropriations. A landuser may qualify for an additional $2 per acre in a field when they implement a nutrient management plan in conjunction with the installation of a conservation practice. Maximum cost share payments for terrace systems must be based on the average cost for narrow ridge or grassed backed terraces. Broadbase terraces may be constructed. However, the maximum incentive payment will be based upon the average cost for constructing narrow ridge or grassed backed terraces. NRCS Practice Standard 638 records Water and Sediment Control Basins by number of basins constructed. The Department provides incentive payments based on average cost per foot and will record the number of basins installed. Streambank erosion is a natural process that occurs in all streams as water wears away the soil and rock that form their banks. As the banks are worn away, streams naturally and slowly establish a meandering course. Streambank erosion in Illinois has, however, been accelerated by land altering activities, such as stream channelization and straightening, removal of streamside vegetation, construction of impervious surfaces and other activities which increase drainage water flow and water velocity. Streambank erosion has become a serious threat to the land, water, plant and animal resources along many streams in Illinois. Streambank erosion, when left unchecked, can be responsible for the loss or damage to valuable farmland, wildlife habitat, buildings, roads, bridges and other public and private structures and property. Streambank erosion is also a major source of sediments deposited in Illinois lakes, streams and backwater areas, and may contribute to as much as 30-50% of the downstream sediment load. Sediment reduces stream channel capacity, which may increase flooding and streambank erosion, or reduce the depth and holding capacity of lakes and reservoirs. Excessive sedimentation also degrades water quality and destroys fish and wildlife habitat. To address these needs, the Streambank Stabilization and Restoration Program (SSRP) has been established. The SSRP will provide demonstration and cost-share projects that will target cost-share monies to severely eroding streambank sites where effective low-cost streambank stabilization techniques can be established. The primary goals of the SSRP are to develop and demonstrate vegetative, stone structure and other low-cost bio-engineering techniques for stabilizing streambanks and to encourage the adoption of low-cost streambank stabilization projects by making available financial incentives, technical assistance and educational information to landusers with critically eroding streambanks. • Stabilize and restore high priority streambanks that are severely eroding using dormant plantings, vegetative materials, stone structures and other low-cost techniques. • Reduce the loss of streambanks and reduce loss and use limitations on adjacent land areas, including agricultural land, urban land, wildlife habitat and other properties and land uses. • Reduce soil loss and the resulting sedimentation that can fill stream channels and deplete the holding capacity of lakes and reservoirs. • Protect water quality by reducing nutrients and chemicals contained in soil material or runoff waters from entering a stream or water body. • Protect aquatic life and habitat, and fisheries by reducing erosion and sedimentation and restoring beneficial vegetation. • Protect real estate, public and private property, infrastructure, public works, buildings and structures and other investments or improvements. • Protect, create or restore wildlife habitat. • Improve land and water aesthetics by stabilizing streambanks with natural vegetation. • Slow stream velocity during high water or flooding conditions and reduce flood damage. • Demonstrate the effectiveness of low-cost streambank stabilization techniques to the public. All landusers and project sites (rural and urban) in each Illinois county are eligible for a SSRP demonstration project, watershed project and/or cost-share assistance provided that the project site meets the assessment and selection criteria established for successful streambank stabilization using approved low-cost, vegetative, stone structure and/or other bio-engineering techniques. All project proposals must be sponsored and prepared with the approval of the local Soil and Water Conservation District (SWCD) Board and with the technical assistance of qualified staff from the SWCD, USDA Natural Resources Conservation Service and/or the Illinois Department of Agriculture. • Labor – for operation of equipment by contractors and the labor involved in installation of stabilization materials (at local prevailing rates). • Equipment – the cost involved in operating earth moving equipment for bank shaping and material installation (at local prevailing rates). • Materials – the purchase of dormant cuttings, vegetative revetments, riprap, and other necessary materials for the installation of low-cost stabilization techniques. SSRP proposals received by the established deadlines for submittal will be reviewed, evaluated and selected by the Illinois Department of Agriculture, with input from the SSRP Advisory Committee. Proposals will be evaluated using the criteria specified in these guidelines. The number of projects selected will be based on the amount of funding appropriated for the SSRP in the fiscal year in which the project proposal is submitted. All sponsoring SWCDs will be notified in writing by the established date of the decision regarding project approval or denial. • Assurance that the project can be completed in a timely manner following approval. • A fully completed site assessment form indicating a good potential for a successful project utilizing vegetative materials, dormant plantings, stone structures or other low-cost streambank stabilization techniques. • The severity of streambank erosion based on the length of streambank affected, the amount of bank lost annually and the total number of cubic feet or tons of soil loss annually. • Cost/Benefit – based on the linear feet of bank stabilized per cost of installation. • Trained technical staff – the availability of technical assistance by staff that have had training in streambank erosion control site assessment and restoration techniques. • Trained contractors and equipment availability – the availability of trained land improvement contractors with the skills and proper equipment necessary for installing vegetative materials, dormant plantings and other low-cost streambank stabilization techniques. • The presence of a public water supply intake (lake or stream) downstream from the streambank erosion site that may be affected by sedimentation and that may benefit from the project in terms of sediment reduction and improved water quality. • The presence of unique habitat or cultural features where stabilizing a streambank may provide or protect important aquatic or wildlife habitat, provide recreational benefits or protect important cultural sites. • The presence of infrastructure where the stabilization of streambank may protect valuable improvements (i.e. bridges, roads, gas lines, power lines, fences, homes, buildings and other property or structures) that may otherwise be damaged or lost. • The availability of other cost-share monies or in-kind services for streambank stabilization that may supplement state dollars. • The visibility of the project site from nearby roadways or locations where its effectiveness can be seen and demonstrated to individuals interested in streambank stabilization techniques. • The proposed project is a part of a resource or watershed management plan or strategy, and is contained in a high priority watershed as identified by IEPA, DNR, or IDOA. Each SSRP project approved for funding must have a completed SSRP-1a (Agreement Terms and Conditions form), signed by the landuser, prior to issuing authorization to initiate the project. The Agreement Terms and Conditions form is a legal and binding document between the landuser and SWCD outlining the responsibilities and obligations of the landuser for constructing and maintaining all approved cost-share streambank stabilization projects, as well as agreed to non-cost-share supporting projects (i.e. fencing to exclude livestock). The agreement signed by the landuser and the SWCD will also state the length of time for which maintenance responsibilities are obligated by the contract. The landuser is responsible for maintaining or performing all agreed upon projects for 10 years from the date of installation. The Stephenson County Soil and Water Conservation District provides Soil Borings for Septic Suitability – This test insures that soils used for absorption fields can both receive/dispose of AND treat septic effluent. The Land Evaluation and Site Assessment (LESA) system helps state and local officials make sound decisions about land use. Combined with Forest measures and Rangeland parameters, LESA can provide a technical framework to numerically rank land parcels based on local resource evaluation and site considerations. In agricultural land evaluation, soils are rated and placed into groups ranging from the best to the least suited for a specific agricultural use, such as cropland, forestland, or rangeland. Then, a relative value is determined for each group. For example, the best group may be assigned a value of 100, while all other groups are assigned lower values. The land evaluation is based on data from the National Cooperative Soil Survey—often called the largest and most valuable natural resource database in the world. 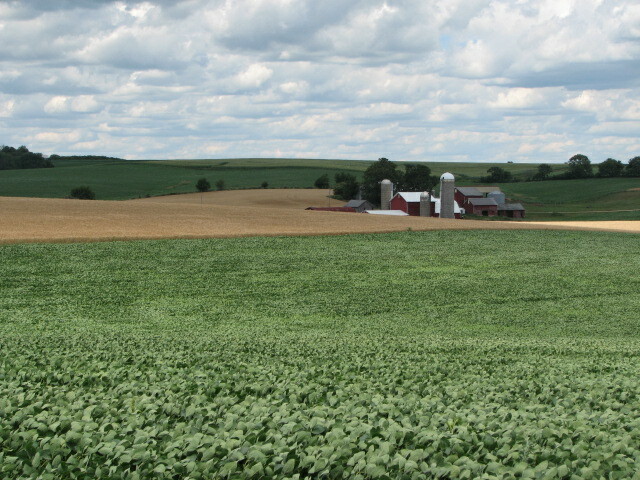 Land Evaluation and Site Assessment activities such as measuring land and productivity assist landowners and others prior to making land use conversions to non-agricultural uses. • Non-soil factors related to agricultural use of a site. • Factors related to development pressures. • Other public values of a site. Each factor selected is assigned a range of possible values according to local needs and objectives. This process provides a rational, consistent, sound basis for making land use decisions. The purpose and intent of the Natural Resource Information report is to furnish natural resource information to officials of the local governing body and other decision makers. Decisions concerning variations, amendments, or relief of local zoning ordinances may reference this report. Also decisions concerning the future of a proposed subdivision of vacant or agricultural lands and the development of these lands because of these decisions may reference this report. This report is required under 94 Act Ill Complied Statues, Chapter 70 Paragraph 405/1 Et Seq. and Ill Revised Statues, Chapter 5 Paragraph 106 Et Seq. The Natural Resource Information report intends to present the most current natural resource information available in an understandable format. It contains a description of the present conditions and resources available and their potential impact on each other. The report comes from the following: standardized data, on-site investigations, and information furnished by the petitioner. Please read the entire report to coordinate and inter-relate all natural resource factors considered. The report, when used properly, will provide the basis for good land use change decisions and proper development while protecting the natural resource base of the county. The conclusions of the Natural Resource Information report in no way indicate the impossibility of a certain land use. However, it should alert the reader to possible problems that may occur if the capabilities of the land are ignored. • Information on the percentage or location of wetlands on the parcel.